The final renewal day of this page is March 28, 2006. 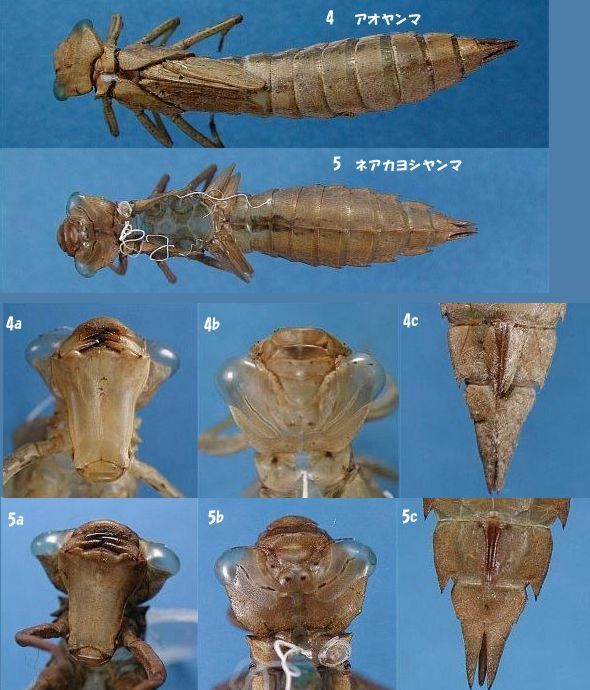 This page is exuviae of Oligoaeschna, Planaeschna, Boyeria, Aeschnophlebia. Each sign is expressing the following. 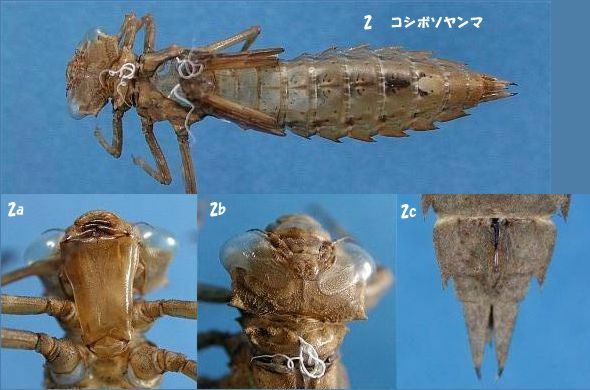 a: labium, b: figure that saw the head from the back, c: female primary genitalia, d: end hook of labium As for the figure of the whole shape of exuviae the magnifying power is same. 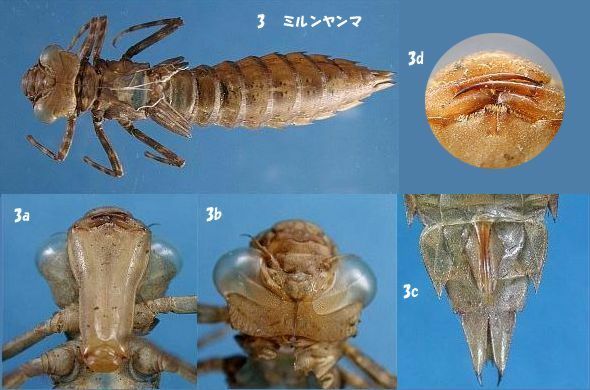 1　Oligoaeschna pryeri (Martin)　Size of exuviae　Length: 28-34（average:31.0）mm, Head width :9.0mm, Width of the abdomen: 9.1mm ( The width of the abdomen is a maximum value.) Lateral spine is in 6-9 abdominal segment. Oligoaeschna pryeri is smaller than other Aeshnidae. Also, a distinction is produced because there is a characteristic in the form. 2　Boyeria maclachlani (Selys)　Size of exuviae　Length: 44-48（average:46.3）mm, Head width :9.6mm, Width of the abdomen: 9.9mm ( The width of the abdomen is a maximum value.) Lateral spine is in 4-9 abdominal segment. Boyeria maclachlani resembles in Planaeschna milnei. However, the exuviael of Boyeria maclachlani is bigger than Planaeschna milnei. Also, there is the thorn that was pointed behind the head（occiput）of Boyeria maclachlani. With this thorn we are distinguished with other species. 3　Planaeschna milnei (Selys)　Size of exuviae　Length: 37-40（average:38.5）mm, Head width :8.3mm, Width of the abdomen: 8.4mm ( The width of the abdomen is a maximum value.) Lateral spine is in 5-9 abdominal segment. 4　Aeschnophlebia longistigma Selys　Size of exuviae　Length: 42-49（average:46.5）mm, Head width :9.1mm, Width of the abdomen: 7.9mm ( The width of the abdomen is a maximum value.) Lateral spine is in 6-9 abdominal segment. There is dorsal spine in Aeschnophlebia anisoptera. However, there is not dorsal spine in Aeschnophlebia longistigma. 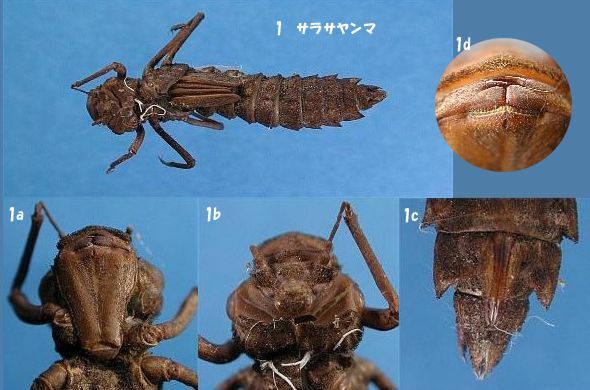 5　Aeschnophlebia anisoptera Selys　Size of exuviae　Length: 42-45（average:43.5）mm, Head width :9.0mm, Width of the abdomen: 9.1mm ( The width of the abdomen is a maximum value.) Lateral spine is in 5-9 abdominal segment. Aeschnophlebia anisoptera has dorsal spine to 8-9 abdominal segment. Dorsal spine is not in other Aeshnidae. There is not dorsal spine in Aeschnophlebia longistigma. Aeschnophlebia anisoptera has dorsal spine to 8-9 abdominal segment. Dorsal spine is not in other Aeshnidae. Therefore, we can distinguish Aeschnophlebia anisoptera easily.